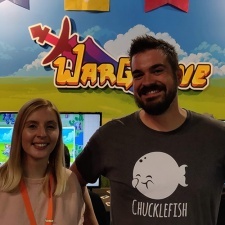 Founded in 2011 in London as a game developer, Chucklefish soon switched things up and started publishing titles, too. The firm helped Yeti Trunk launch Wanderlust: Rebirth on Steam the following year after that studio - who were friends with Chucklefish - asked for advice on another publishing deal. "It was a 50 per cent publishing deal," product manager Tom Katkus (far right) says. "We said we could help out at a much more reasonable agreement. That's how we've been carrying on since then." Marketing strategist Katy Ellis adds (above right): "I think being fair to developers is a big part of our publishing vibe as well. We're not messing them over with publishing deals. We want to be supportive of them. We don't want them to at any point feel that the deal was a mistake or they've been taken advantage of. Part of that is being really upfront about what we do and what we think we can help with and making a fair arrangement." While Chucklefish has been publishing games for some six years now - most notably with cult farming title Stardew Valley - it's mostly been an organic learning process. Where some firms turn to this business and make a massive investment hiring experts from the field, Katkus describes his company's approach to publishing as being self-taught. "It's been a learning process. For a lot of us, we didn't have experience with games development. Starbound was the first game for most of us and for all of us, we had no experience with publishing," he admits. "Our publishing business is entirely self-taught - we didn't have someone who was an expert coming in telling us how to do it all. It was a situation of us helping friends, offering them support and resources that we had just because we're a business and a lot of these developers are just individuals. Then it organically grew from there." Asked what the biggest lessons from this transition were, Katkus says that the main learning has been to trust your gut about the games that have genuine, um, passion behind them. "The biggest lesson I've learnt is one that drove us into publishing to begin with, which was to look for games that have passion and the people who are making them are passionate and enthusiastic about them," he says. "It's been reinforced, I guess, as we've gone along with games and developers that we have worked with who just really love what they are doing and the projects that they are working on, that translates to the players. It has more of an impact than any marketability or numbers on sales for genres or any charts like that. Just looking at love and translating that through the project is, I think, the best way to be successful as a developer." Ellis adds: "We have been inspired by a lot of the passion projects that have come in. Inmost developer Hidden Layer Games used to be a mobile work-for-hire company so they made match-three titles and they would make them for clients to fund the next project. It was a cycle. "Then they had a dream of one day wanting to make this atmospheric horror game so they basically gambled their whole company to make their dream project. "They took it to an event where there was a prize pool for the best game and they knew they had one chance. They won the prize pool and at that point, when we started talking to them, we were very excited by what they were working on. It's mostly those relationships with a game that get us excited." As a publisher, Chucklefish is somewhat unique. Where when the firm was first founded in 2011 - and started publishing in 2012 - indie titles by and large featured cute art styles rendered in pixel art. For the most part the publishing firms that made it big then such as Team17, Devolver Digital and Curve, have moved away towards projects with a larger scope. Chucklefish's line-up, however, is still largely these smaller-scale releases. "It's been really important for us as a publisher and a studio to not lose who we are," Katkus explains. "A big part of that is not expanding too quickly. Our studio has been the same size since we started, pretty much. We're up to 18 people now. "But our fear - and almost certainty - is that if we grow beyond that, it'll get to a point where we change how we work. We'll start having to have meetings to communicate things because we won't know what's going on. People will start working in separate teams, there'll be middle management. It'll create a whole different structure."